This has been on the back-burner for a while. Initially the site was transferred into Callisti's website hosting service toward the end of last year. The vision was to develop a Dr Martens focussed ecommerce site as these products seemed to perform well online, while reducing the in-shop administrative burden of monitoring and updating hundreds or thousands of products. The site was developed for Christmas 2009 but hit a snag with Dr Martens (who advised against the particular design and domain name we'd settled on.) So what we have done is used a Zen Cart ecommerce engine to replace the previous incarnation of CubeCart and merged the first new build structure into the existing Outdoor Spirit design. 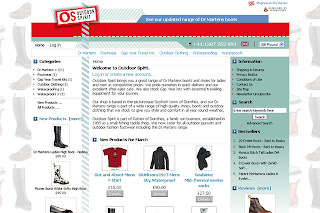 The outdoor-spirit.co.uk has a domain history which can be used and is also familiar to existing customers. More subsidiary work is being done to build around the Outdoor Spirit brand using content channels such as Youtube, a Blog presence, and other linked entities to help promote and review products and provide relevant outdoor activity feedback to help inform website visitors. Other initiatives such as the Gap Year travel kit have helped package outdoor equipment into one stop shop kits that offer savings to customers and ease of in-shop administration.